Although not difficult, the length of the trek, the number of nights sleeping above 4000m and the number of high passes warrants a grade of Hard. Day 1: Drive from Huaraz to the village of Llamac to set up camp 3300m. 4 to 5 hours drive. Day 2: Follow the river Llamac, hiking gradually up the valley to camp in open grassy countryside at Quartelhuain 4200m 6 hours. Day 3: Cross our first pass Punta Cacanan 4700m then descend to camp at a large lake Laguna Mitucocha 4220m. 6 hours. Day 4: We climb steadily to our next pass Paso de Carhuac 4650m to camp at trout filled Laguna Carhuacocha 4150m 6 hours. At the head of the lake are the giant peaks of the Huayhuash – Yerupaja, Jirishanca & the famous Siula Grande. Day 5: We spend an extra day at spectacular Carhuacocha. Hike up to visit the three lakes of Siula, take an easy walk around Carhuacocha lake, go trout fishing or have a rest day and enjoy your mountain surroundings. Day 7: We pass through the small settlement of Huayhuash where a few farming families live and then climb to yet another pass Portachuelo de Huayhuash 4750m. We descend past a large lake Viconga where we often see large herds of Llama and Alpaca to camp at 4480m 6½ hours. There are natural hot spring baths near the camp – enjoy your first hot bath for several days !! Day 9: A demanding climb up to the Pass Cerro Antonio (4788m). From the pass we have the most stunning views of the trek, we can see Siula Grande Base Camp and Siula glacier and several small jewel blue lakes. The descent is steep at times and we traverse above Laguna Jurau to camp in the Quebrada Calinca at Cutatambo 4100m 5 to 6 hours. A demanding but fantastic days hiking. Day 10: We visit the base camp of Siula Grande (Joe Simpson – “Touching The Void”). We can clearly see the route that Joe followed crawling down the glacier and across the moraine rocks to reach the campsite. Day 12: A shorter day which is appreciated after the hard day yesterday. Cross the Pass Punta Tapush 4750m to Laguna Susucocha and Cashpapampa 4500m 3 to 4 hours. Day 14: An extra day at Laguna Jahuacocha. Climb up Cerro Amarrillo Peak 5000m, visit Soltera Cocha Lake, hike up the pass Sambunya 4750m OR take a rest and try trout fishing. This trek offers the most spectacular mountain scenery and lakes on the Alpamayo Base Camp Circuit, but is a condensed version of our classic 12 to 13 day complete Alpamayo Circuit trek. 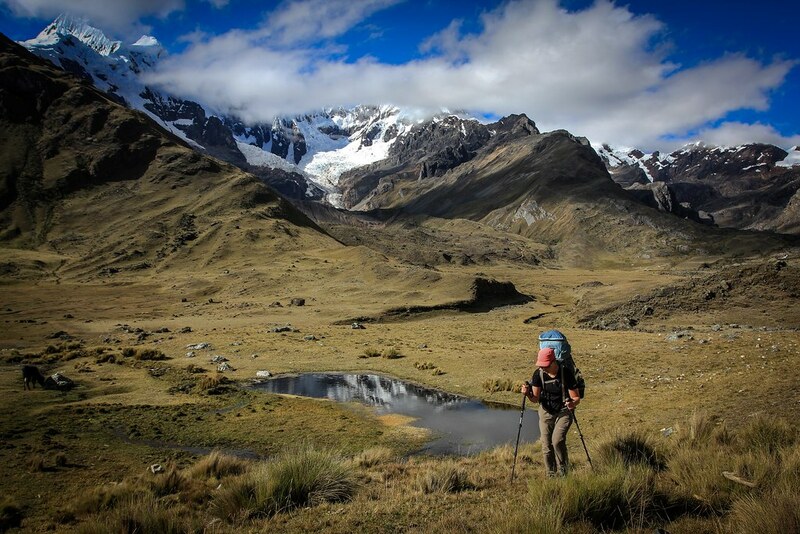 The trek features views of the stunning pyramid shaped Alpamayo, once voted to be the most beautiful mountain in the world and then the crystal blue lake Cullicocha nestled at the base of Santa Cruz Mountain. The description here is for the gentler 10 day option, but the trek can be condensed down to 9 or even 8 days for fit people who are very well acclimatized. Please contact us to discuss which option may be best for you. We can advise after considering your level of fitness & previous trekking experience. Leaving another lonely bivaouc spot at the foot of the north face of Pucajirca (6046m). Huascaran National Park. Cordillera Blanca. Peru. Day 1: Drive from Huaraz past Llanganuco Lakes and over the Pass Portachuelo 4750m to Vaqueria (3600m) 3 ½ hours drive. From Vaqueria we have a relaxing trek about 4 hours on a gradually rising path to a secluded campsite in the Paria Valley 3800m. Day 2: Two hours hike further up the valley to camp at Tuctubamba 3950m. We can make a side trip on the way and climb up to the top of the pass Punta Union 4750m to have fantastic views down into the Santa Cruz Valley. 3 to 4 hours extra. Day 4: We climb to another pass Tupatupa 4400m & descend to camp at the top of a wide valley at Jancapampa (3600m). Directly behind camp we have views of a huge hanging glacier. 7 to 8 hours. Day 7: We stay another night at Cruze Alpamayo Camp. Climb up the moraine to the lake Laguna Jancarurish for close up views of Alpamayo or continue upwards towards Alpamayo Base Camp (4500m). 5 to 6 hours return. Or REST DAY. Day 8: Tomorrow is a hard day. We make it easier on ourselves in the 10 day trek option by today hiking down the valley to a secluded campsite away from the main trail named Plataforma de Valle Dos Cedros (4200m) 3 hours hiking. In the afternoon relax & enjoy the mountain views in preparation for tomorrows hike.